Description: Tierra del Fuego and Magellanica. Coloured. 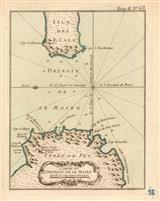 Description: Strait la Maire between Terra del Fuego and Staten Island. Elegant chart with cartouche. Original colour. Description: Map showing the Magellan straits and illustrating the lands inhabited by Fuegan tribes. Printed colour.